Swan Hill Rural City Council has prepared a draft Master Plan for the South West Development Precinct in consultation with the landowners and relevant State Government Agencies. The draft Master Plan and the background documents were exhibited for a period of one month to receive comments from affected landowners and occupiers, State agencies and the general public. Comments received during stakeholder consultation were considered as appropriate and changes were made to the Master Plan. The Master Plan provides directions for the orderly land use and development outcomes of the South West Development Precinct (SWDP) and shows the proposed collector roads, key intersections, proposed shared paths and street trees, areas for future bus stops, an area suitable for neighbourhood activity centre (Commercial 1 Zone), Ken Harrison Reserve as the main Public Open Space for the precinct, areas to be retained in their current zones, buffer distance from adjoining properties that are used for non-residential uses, minimum lot sizes for lots fronting and/or abut land within Farming Zone and Low Density Residential Zone, locations for gateway features, current overlays to be retained (Airport Environs Overlay and Design and Development Overlay – Schedule 1 both are associated with the Swan Hill Airport) and proposes to removed the existing Development Plan Overlay- Schedule 2 from land within the SWDP. The Master Plan also encourages medical centres, childcare centres and aged care facilities within the SWDP subject to planning requirements. The Master Plan identifies the Goulburn Murray-Water (GMW) channel to be decommissioned and the locations for the proposed Lower Murray Water and Goulburn-Murray Water pump stations. Decommissioning of the Channel, and the provision and location of the pump stations are dependent upon the final decisions of respective authorities. Further, future rural water supply for the rezoned land will be dependent upon approvals and connections from GMW. Individual landowners must organise these independently and directly with GMW at their own cost. The Master Plan will be implemented through a series of amendments to the Swan Hill Planning Scheme. Six amendments have completed public exhibition in September 2015. 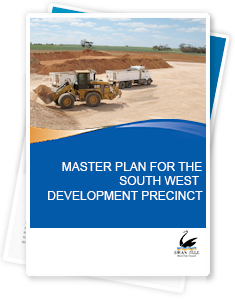 Council at its meeting on 20 October 2015 adopted the Master Plan for the South West Development Precinct.